Our storage racking uprights have a load capacity of up to 7,000 pounds, depending on load distribution and beam placement. These uprights are manufactured from high-tensile steel and are made to handle your heaviest loads. They're available in a wide variety of heights and widths. 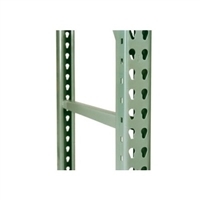 Our teardrop pallet rack uprights are designed for quick and easy installation, and when coupled with a set of our load beams, they will provide the basis for the most popular type of pallet racks in use today for warehousing operations. The teardrop configuration of these racking uprights makes putting them together with the cross beams a snap, requiring only a few simple, inexpensive additions like spacers for uniform spacing between racks and front-to-back supports for added stability. It's also a good idea to cover the lower end of your pallet rack uprights with some protection against mishaps, such as a forklift collision!